Grounds for Sculpture in Trenton, New Jersey; the Frost Art Museum in Miami, the City of Osaka in Japan, the Torode Group of Companies in Calgary, Canada; Laumeier Sculpture Park in St. Louis, Missouri; the Morton Arboretum in Chicago, IL and the Los Angeles County Museum of Art, among others. Tobin is perhaps best known for the Trinity Root, the first and only 9/11 memorial near Ground Zero in Lower Manhattan. The famed bronze casting of "the tree that saved St. Paul's Chapel" on that fateful day is permanently sited at the corner of Wall Street and Broadway, and has attracted millions of visitors since it was installed on the four year anniversary of the attack on the World Trade Center. About Steve Tobin: Steve Tobin is a visual philosopher based in Quakertown, Pennsylvania. He holds a B.S. in Mathematics from Tulane University and has worked in various media throughout his career. His vast repertoire includes works in glass, clay, bronze, and steel. His work often explores natural forms, and the artists cites nature as his earliest influence, one that continues to inform his work. Tobin's work is part of permanent collections at American Craft Museum; Philadelphia Museum of Art; American Glass Museum; and Musee des Arts Decoratifs, Switzerland. 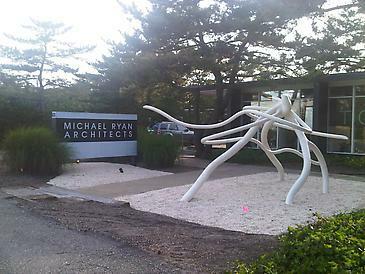 About Michael Ryan Architects: Michael Ryan established his architectural practice in 1989, in Loveladies, New Jersey. Taking the position that architecture is an art, the firm offers a comprehensive approach to design, viewing architecture and interior design as interdependent disciplines. The firm’s reputation has broadened its geographical base beyond the Loveladies office location, to include work in Philadelphia, Maryland, Delaware and New York City. In 2004, the firm moved its main office to Philadelphia, Pennsylvania to continue expanding its efforts. Transcending the temporal qualities of style and taste, Michael Ryan Architects focus on imparting a timeless quality consistent with the permanent nature of architecture. Blending architecture, interior design, and custom furniture design to create complete, thoughtful, unique spaces rooted in a modernist aesthetic, the firm seeks to combine order and accommodation, front and back, and interior and exterior to create simplicity derived from understanding the subjective use and desire of the space. About Bridgette Mayer Gallery: Bridgette Mayer Gallery was founded in 2001 with the primary purpose of identifying and promoting promising emerging talents in the field of contemporary painting in and around Philadelphia. The Gallery's focus has since shifted over the past decade to encompass established and mid-career artists working in diverse media throughout the United States and abroad. In addition to its commitment to its contemporary program, Bridgette Mayer Gallery also deals in the secondary market with a focus on Modern Masters and key figures of Abstract Expressionism. Bridgette Mayer Gallery regularly participates in art fairs including Art Miami, Aqua Art Miami, Art Palm Beach and the Dallas Art Fair. In 2011, the Gallery will inaugurate its newly-renovated 2,000 square-foot Washington Square space.